Today's Tip: Use a pre-decorated piece of chipboard, preferably with glitter, to add instant bling! "It's beginning to look a lot like....cough, sputter, ack...It can't possibility be close to Christmas, can it? I can hardly believe that September is around the corner, which puts us a mere three and a half months from Christmas! Someone slow down the clock...I am not ready to even consider cold weather and holidays...I am, however, ready (almost) to think about holiday cards thanks to a CAS (Clean and Simple) theme challenge posted on SCS. About two years ago, I purchased an adorable holiday kit from Say it with Letters. 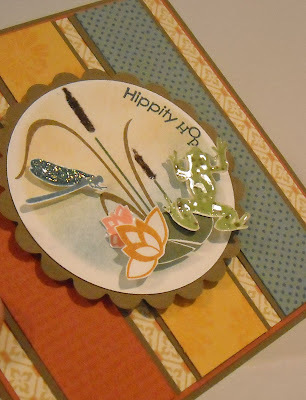 The kit included a chipboard album, lots of fun embellishments, and fantastic papers. When I set out to create today's card, I remembered those wonderful papers. I found a few left over scraps (I have managed, in two years, to cover the pages of the album...) that were a perfect accent and combination for my card. Don't they look great together? I wish I knew what company the papers are from...anyone know? The sparkly tree was also included in the SIWL kit and I actually plan on using it on the front of the album, if I ever get around to finishing it! The tree looked so great with this card that I had to go with it and then I'll reuse it on my album. 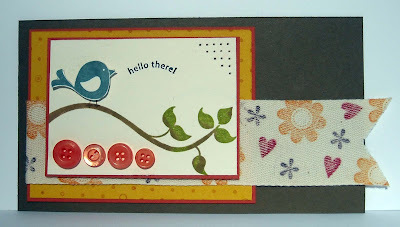 :-) The cardstock and ribbon is from Stampin' Up! and the sentiment is from a MFT set. Enjoy and raise your hand if you'd like to turn back the clock to June and start the summer over again! Anyone out there working with digital stamp images yet? I think it's a fantastic idea and one that is going to start really catching on...It is so easy to just print out your desired image, no need to worry about any uneven inking! And think of how much space you would save in your stamp studio! :-) This is a card I created last year for a new online publication, however, I don't think the magazine ever made it off the ground as I have yet to hear word of it's launch and can't find any details about a release date. Hope they make finally make it to print... This card was created using a digital print from a company that Sonia and her sister started (the business has been put on hold for awhile). Sonia sent me a batch of beautiful floral images...now how did she know how much I love flowers...and this was one of the designs included. I simply printed the image out on my laser printer, colored it with Copics, added a sentiment and few embellishments! Easy peasy! The background paper is from K & Co. and the remaining ingredients are from Stampin' Up! Enjoy! The foundation of this card popped into my head on Friday evening and by Saturday morning I was at work in the studio! I knew I wanted kraft cardstock and white polka dots, a sentiment on the left hand side of the card, and a large image on the right. Everything came together quickly with the exception of the image...I hemmed and hawed, what in the world did I want to use as an image. Flowers tend to be my typical "go to" image, I love flowers, but I had images from a Papertryink stamp set in head and I don't own that one...yet...shhh...don't tell my hubby that eyeing more PTI sets... I then remembered that Dawn McVey had created a card (and I think a tutorial but I couldn't find it) using a flower that she created from torn paper. I searched and searched and found the card with the flower! Ah-ha! The perfect idea for the empty space on my card and a fun new technique to try!! My flower is more 'round' than Dawn's, she went with a rounded petal shape, but I just adore the end result! And this was another great way to use up paper scraps!! I also really roughed up the edges and added some distress ink to my flower. 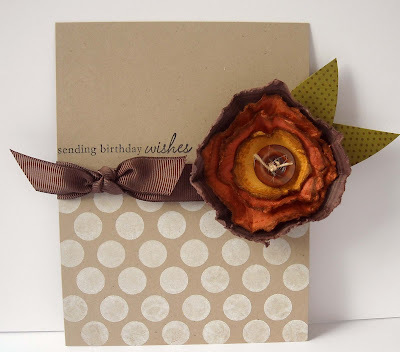 I really liked the combination of the very vintage, aged petals against the super clean lines on the rest of the card. And this would be a great Keep it Simple Sunday card too! You guys got a two for one deal this week! :-) The polka dot images (on the bottom of the card and leaves) are from PTI, as is the button, twine, and sentiment. And there's that super fabulous PTI white ink...to die for coverage! 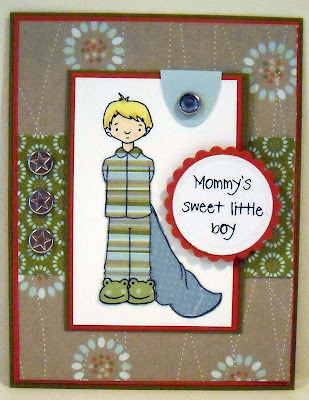 The cardstock and ribbon is from Stampin' Up! Enjoy and why not try a new technique this week!! 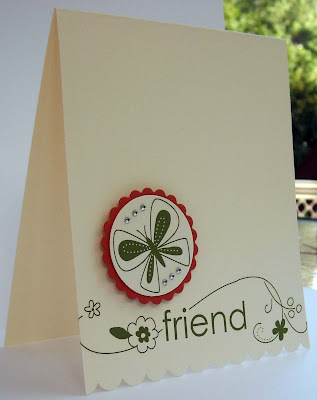 Today's Tip: Use punches to create a design for your card...not much else is needed! Isn't this ice cream sundae adorable! Just yesterday I received what is probably my last Stampin' Success magazine from SU! (I recently gave up being a demo) and inside was an article on using punches to create different designs; animals, flowers, mushrooms, and this ice cream sundae. I couldn't wait to try my hand at making the sundae! It was super easy to create and a great way to use up those piles of small paper scraps. I didn't have all of the SU! punches that were used in the original creation so I improvised by using my plain circle Nestibilities. The bowl was created using the 2.5" circle die. I then cut about a 1/3 of the circle off of the top, leaving a bowl shape. The three ice cream scoops were created using the 1" circle die. The toppings were created by using a SU! scalloped circle punch. I glued the scallop section to the top of the scoop and then just cut off the excess, following the curve of the scoop. The banana was the trickiest...I used a large SU! oval punch and then one of the circle Nestibilities dies to cut the half circle into the oval. I had to use scissors to round off each corner. The cherry is created using a regular hole punch and I hand cut the tiny stem. Everything was attached to the card front with dimensional tape. The patterned cardstock is from Papertryink (one of those "must have" purchases from the CHA Super Show), the Men of Life Collection. The sentiment is also from PTI, from their Button Bits set. The button is from my random bag 'o buttons. I loved playing with the punches and will definitely try my hand at making some of the other projects listed in the SU! magazine....Until then...Enjoy! Stamping Around PA Registration is Open! It was Ruth's turn to set the challenge for the SALT team this week and she chose Purpose, as in how does your purpose in life change once you become a Christian. Ruth did an amazing job summarizing her thoughts around this topic and you can read her write up on the SALT blog. One of the first questions posed in the Westminster's Shorter Catechism is "what is the chief end of man", that is why are we here, what are we to do with our lives? It's a basic question I think most thoughtful people ponder from time to time. Many might answer this question with popular ideas, "to be happy", "to be successful", "to give to others", "to be a good parent" and so on. While none of these goals are in themselves wrong, they fall short in fully answering the question of why we're on this earth. The Shorter Catechism provides the simple, yet profound, answer, "to glorify God and enjoy Him forever." In a nutshell, our main purpose, our main goal in life should be to glorify God. (You can read the following scripture texts as proof for this statement, Psalm 86, Isaiah 60:21, 1 Corinthians 6:20, 10:31, Romans 11:36, Revelation 4:11) And I just have to share two of my favorite verses from this group: 1 Corinthians 6:20, 10:31, "For you were bought at a price (that price is Christ's sacrifice on the cross. ); therefore glorify God in your body and in your spirit, which are God's." and "Therefore, whether you eat or drink, or whatever you do, do all to the glory of God." I am convinced that a Christian may strive for the things mentioned above. The difference is that once we know Christ, our purpose is different. Instead of seeking, for example, the praise of men for doing a good job, we will rather seek to glorify God not only by doing the best job we can but by also giving God credit when we are recognized for our efforts. Revelation 4:11, "You are worthy, O Lord, to receive glory and honor and power; for You created all things, and by Your will they exist and were created." I love this verse, it's so full of awe and praise for God. God is worthy to receive our glory and honor because He has made us and it is only by His sovereign pleasure that we are here. He provides us with all that we have; He has provided us with our lives. May this simple truth sink down into our hearts and minds as we work through even the mundane tasks of our lives. Even writing this, I have been reminded of how frequently I complain. 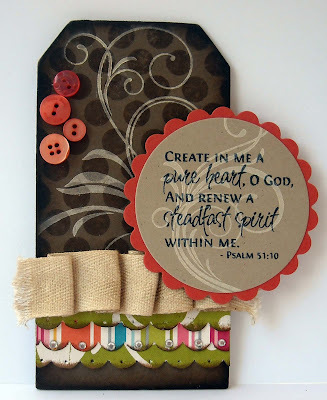 May God be pleased to bring these verses and this topic to my mind the next time I do... As for my chipboard tag...I recently purchased some verses from Verve Stamps and was itching to ink one up. This is another favorite verse; it's so prayerful to God, asking for those things that are so needed during our Christian walk. I was inspired to create a tag by a recent post by Julie. I'm not sure I've ever created a tag like this before but it was a fun project! The polka dot/swirl background was created using two sets from Papertryink (and I have to gush about their Vanilla Cream ink again...oh man, it is good stuff!). The buttons are also from PTI. The scalloped paper on the bottom of the tag is from October Afternoon, tiny rhinestones are from Taylored Expressions, and the twill is from SU! (Gee, I think I covered half of the manufacturers out there in this one project!) This was a great topic and I pray that you're blessed by what the SALT team has created! Please hop over and take a look and, if you're feeling inspired to create something based on the challenge, leave us a comment with a link back to your blog or gallery! 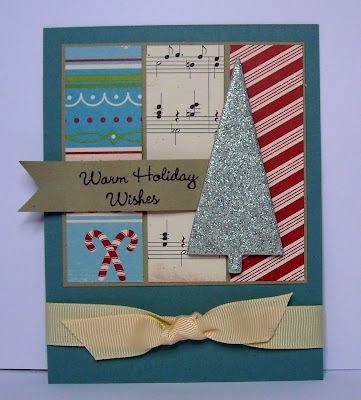 Today's card utilizes the fun you can have with twill tape! SU! sells twill tape in three sizes and this super wide is perfect for stamping. The tape takes ink perfectly, keeping the colors vibrant. 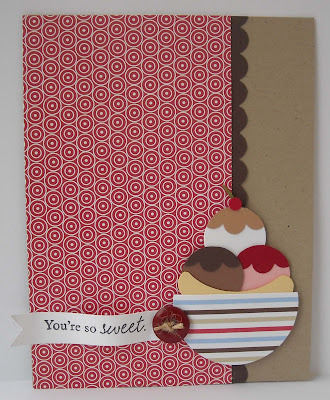 You could even use the tape as paper, creating a strip or strips of patterns across the front of a card. I chose to go the ribbon route today... All of the images used on my card are all from the same SU! set, Cheep Talk. The branch and leaves were colored using the rock and roll technique (I'll have to create a short video to demo this super easy technique! ), and my little birdie is popped up using dimensional tape. The buttons are from Papertryink (I love their buttons!) Enjoy and have a wonderful day! Today's tip: Use rub-ons to create a custom card in under 15 minutes! For the past few months, I've been hoarding a huge draw full of rub-ons...I love these things yet I can not bring myself to use them. That is one down side to rub-ons; when they're gone, they're gone! It's not like a rubber stamp that can be used over and over. That said, I am never disappointed with the finished product when using them! Today's card was super-duper easy! I used a SU! punch to add a scalloped edge to the front of the cream card base and then added one rub-on (also from SU!) to the bottom, right above the scallop. I love this lower case font combined with the swirls and tiny flowers. Since I knew it would be close to impossible for me to leave a card without a small hint of color, I used a butterfly rub-on on a circle, cut with Nestibilities, layered on top of a deep orange scalloped circle. The circle was attached to the card front with dimensional tape. A few tiny rhinestones from Taylored Expressions added the perfect bling accent! Great news! The July issue of SNR has been posted, on a brand new site, and it looks amazing! The new site loads super fast, is very easy to navigate, and the artwork is beautiful! Subscriptions to the online magazine are available at very reasonable rates, starting as low as $4.99/month. And...I have an article titled, "One Stamp, Three Ways" and a few cards published in this issue...be sure to check it out! Last night I had some free time for crafting and went I sat down to create I realized that I've been neglecting my Unity stamps lately. Shame on me!! I pulled out my July KOTM for this card. The kit includes some adorable images, such as a jeans pocket and trinkets to fill the pocket - so cute! I'm looking forward to using those images but last night I wanted something quick and easy to I chose this cute flower and vase image, which was colored with a few pale Copic colors (the colors are a bit darker in person but I guess my bright sunshine this morning washed out my colors...arrggghhh...). This is the first time, in a long time, that I've torn a piece of paper on one of my cards but thought this would be a way to add a little personality to the stamped area, along with a PTI button, aged edges with PTI Chai ink, and some faux stitching. I also used a few of the PTI background stamps on the kraft background but the Chai ink, which was very noticable when wet, faded quite a bit when dry. Kind of bummed me out but you can still make out some texture on the kraft paper. And instead of adding a big piece of ribbon I opted for wrapping some PTI twine around my card and securing in the middle with a tiny piece of PTI ripe avocado ribbon and more twine. The sentiment is from Unity's June KOTM. Enjoy and have a wonderful Friday! Labels: papertreyink, unity stamp co. 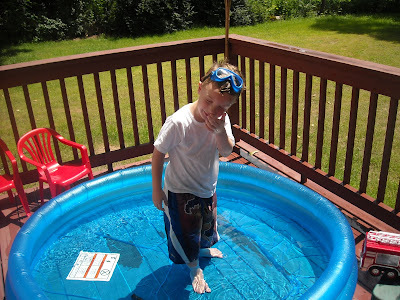 This would be my little Bean pretending to go deep sea diving...while standing upright and wearing his construction goggles from his play Home Depot workbench......Told you he had quite an imagination. At our Stamping Around CT event, the marvelous Ms. Gina K sent over a coupon for everyone at the class to receive a free $19.95 stamp set! How cool is that! 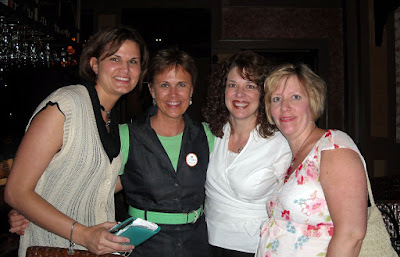 See what great things happen at the Stamping Around events. :-) Don't miss the next one, which is coming up in a about a month in Vermont! Anyway, I digress...(I'm good at that!) I finally got around to cleaning my stamp room and found my coupon under a pile of cardstock. Well who can resist a free stamp set?! 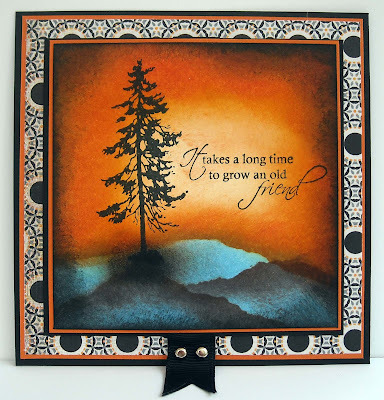 I don't have any Gina K stamps and was excited to receive a set from her...This one, Tree Silhouettes, jumped out at me because I knew it would be perfect for creating those fabulous Michelle Zindorf inspired cards! My stamps arrived today and I wasted no time in getting inky! I decided to tackle today's project with my five-year old and as proof that not only are Michelle's tutorials easy to follow but her techniques are easy (well easy but getting it to really look like Michelle's beautiful work is another story) to re-create, I'm sharing my oldest creation. Isn't that great? 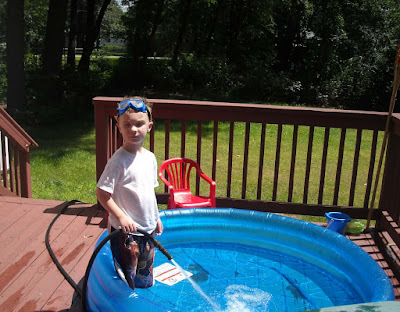 He did the entire thing all by himself. He took Michelle's sponging advice "leave a small white space in the center of your card" quite literally and enjoyed telling me how much better his work was than mine. Wow - tough crowd! He then abandoned his work, deciding instead that using my SU! ink pads as a pretend camera was more fun. 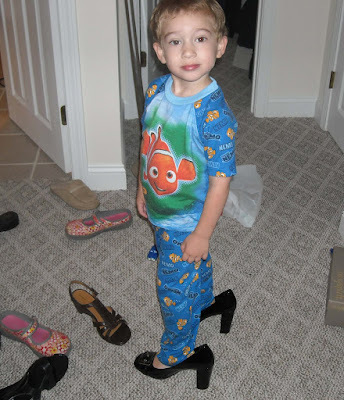 (The kid has quite an imagination!) 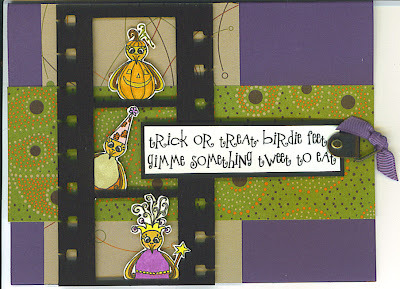 Well I digress yet again...For this card I followed one of Michelle's tutorials step by step. I need to seriously work on my hill effects though! The one thing I always struggle with is that she sometimes sponges black ink around the edges of the finished piece. Every time my sponge hits the cardstock with black ink I cringe. It seems so dark and I am always convinced that I just ruined my card. However, if you keep going you'll notice how much depth it adds when you're finished. I love it! Thanks Michelle for sharing your amazing tutorials and beautiful work! And hey...would you look at that...a decent card photo! :-) Turns out the natural light found outside on my deck is a darn good way to get a good photo! So if you get a lousy photo, you'll know it's raining in New England! :-) Enjoy and have a wonderful Tuesday! Today's tip: Find good lighting when taking pictures of your cards! ;-) OK, that's not the real tip but I really need some good lighting! My old studio had these great overhead lights but I've got nothin' in the new place and I'm weary of my drab card photos! So...my apologizes for the lack of good looking photos lately! 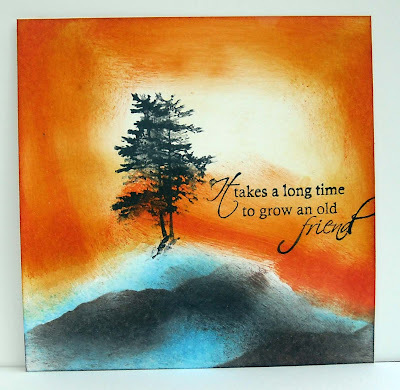 My real tip for today...Use a plain white background as the backdrop for a bit of color and a simple sentiment. I think I've shared a card similar layout before but this week I was inspired by an October Afternoon project I saw in their booth at CHA. You can see those photos here. Since we were able to bring home some samples of the October Afternoon paper, I thought using those papers on a project, asap, was in order! The squares on my card are from their darling Farm Fresh line, which includes an antique looking black and white farm animals print, lots of polka dots, plaids, flowers, apples, and stripes. Fantastic! I paired the papers with the Everyday Button Bits stamp set from Papertreyink as well as one of the stamps from the Background Basics: Text Style set. I also, for the first time, used PTI's Vintage Cream ink and it is just as luxurious as the Snow White ink. The tiny words from the stamp set stand out perfectly on my small square of dark paper. I was really impressed with the coverage and look of the finished image. 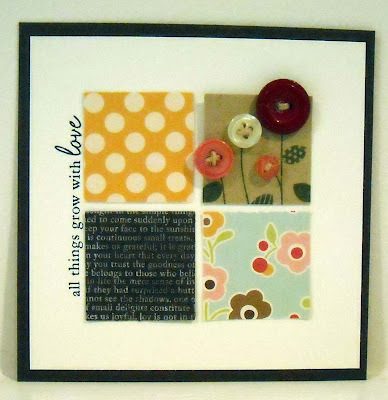 A simple sentiment, also from the Everyday Button Bits set, finished off the card. I hope you enjoyed today's simple card...it only took me two hours to make. Oh ok, it took about three minutes to make the card and 57 minutes to sew on those tiny little buttons...LOL! 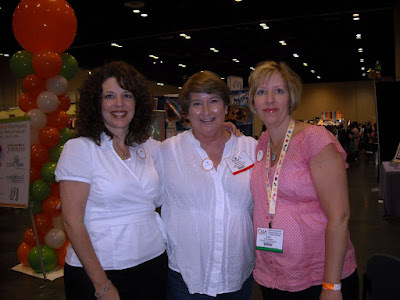 When Julie and I were at the Craft Super Show last week, we visited the My Favorite Things booth to say hi to the MFT girls. And...of course...we had to do a little shopping. *wink, wink* Like many of the manufacturers at the show, MFT was offering a show special...buy three stamp sets and receive one for free. Since I'm not one to ever pass up a sale (my husband likes to ask me how much I had to spend to "save" him a few bucks)...I quickly picked out three sets to add to my growing collection of acrylic stamps! This image is from the Cuddle Up Carter set and a portion of the proceeds from the sale of this stamp set goes to a cerebral palsy foundation. The set is fashioned after the son of one of the MFT employees, named Carter, who has CP. Well, you can't tell a mom who is desperately missing her sons, one of who shares has the same name, this story. I started to well up right there in the MFT booth! Good thing I was surrounded by women who would understand my mental breakdown! LOL! There was no way I was about to leave the show without this darling set! Doesn't this little boy stamp have the sweetest little face? And the saying is so precious...All of the words in this set are separate so you can create your own sentiment. Love that! 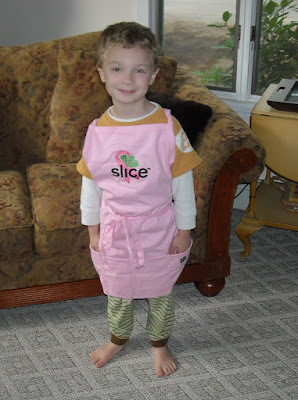 All of the PJ's, slippers, and blanket were paper pieced with designer paper from Stampin' Up! Doesn't that stripe paper make the best PJ's, they look like flannel. The rest of the card was also created using SU! supplies. Be sure to stop by the MFT store and check out their fantastic images! I'll be showcasing more from the other sets I purchased over the next few weeks. Enjoy and have a wonderful weekend! This week Pauline had the opportunity to present the SALT team with our challenge and she chose the story of Jonah, more specifically, Jonah's imperfections. Pauline has provided us with an excellent write up, which you can read about here. I love the story of Jonah! It's a clear picture of our fallen human nature and the amazing love of God. Jonah is a tiny book in the Bible, a mere four chapters but in this small book we see the outpouring of God's love and mercy, not only upon Jonah but also upon the city of Nineveh. When God gave Jonah specific instructions to go preach in the city of Nineveh, he refused and journeyed in the opposite direction. 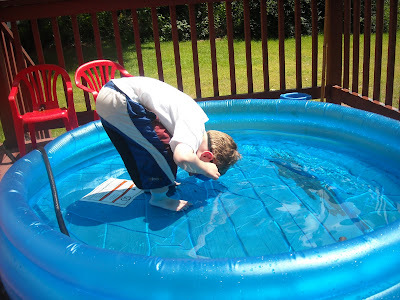 Most know how the story goes from here...Jonah ends up being swallowed by a giant fish, where he sits for three days before being spit out on dry land, after he tells God he's sorry for his disobiedence. Once out of the fish, Jonah hurries to Nineveh! Sometimes I wonder how those in the OT, some who actually heard God speak, could disobey. I mean if God said to me in a voice I could hear, "go to Maine"...I'd go to Maine (or at least I'd like to think I would!) But don't we behave exactly the same way when the Bible, God's word in written form, tells us, for example, "do not covet" yet we spend our time worrying about what we don't have or spending money we don't have. Whether we love God or not, we constantly fail to measure up to His standards of righteousness. That's what makes the end of the Jonah's story so special...Jonah did obey and told the people of Nineveh that God would destroy their city. But the city wasn't destroyed, God changed the hearts of the people and they repented; God spared Nineveh. After all is said and done Jonah utters these words, "for I know that You are a gracious and merciful God, slow to anger and abundant in lovingkindess." The mercy that God showed to Ninevah and Jonah is still alive and well today. If you're breathing then God is showing you mercy, whether you acknowledge Him or not. He is giving you more time to consider the work of Christ on the cross and it's meaning. God also bestows this great mercy and grace upon His children. Unfortunately, I still sin every day and yet God is slow to anger and abundant in lovingkindness! I am continually amazed at God's blessing, in spite of my ongoing struggles with remaining sin. But I am also continually comforted by His great patience and long suffering. No matter what your circumstances or how bad your life has been or is right now, God is able to transform the most stubborn heart...One needs to simply call upon the name of Christ to receive an abundance of love and mercy. Today, my card focused mainly on the scripture verse mentioned above, which I printed from my computer. 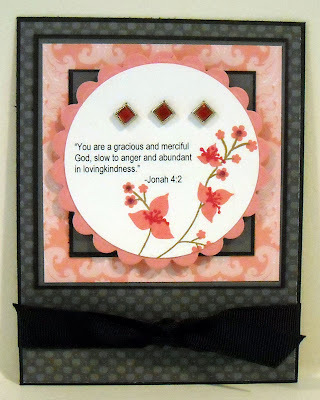 The verse is paired with stamps from the PTI Floral Fusion set, which we received at the Super Craft Show. 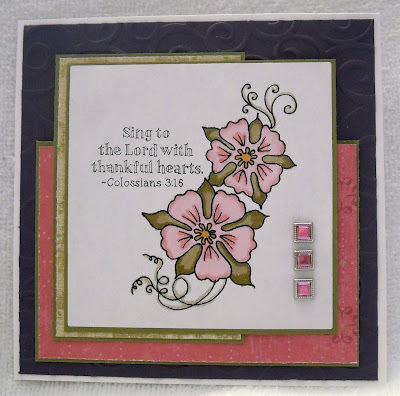 The papers and jewel brads are from Stampin' Up! and there are tiny rhinestones in the center of the smaller flowers thanks to Taylored Expressions. Enjoy and please stop by the SALT blog to see all of the wonderful creations from the entire design team! PS - I wanted to also add this side note, taken from my study Bible, since some might think this a fantastical story, never imagining it could actually be true. However, any raised objections spring from assumptions that deny God's sovereignty in nature and history, including His ability to intervene supernaturally in the created order. If God is God, then He can do whatever He wants, including having a man live in the belly of a fish for three days! This week Nichole challenged her senior design team to create a project mixing patterns. I thought this was an excellent challenge since I adore using patterns on my cards and really like the idea of mixing things up a bit! Last week, while at the Craft Super Show, I managed to pick up (muffled response) stamp sets at the PTI booth and I've been itching to use them ever since I got home. 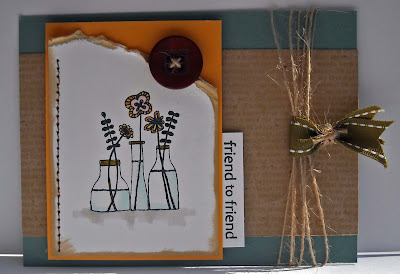 When I read Nichole's challenge I thought this was the perfect opportunity to ink up those new stamps! I confess that my patterns are a little difficult to see...how I need a good lamp for picture taking...since I used a tone on tone (same color ink as paper) approach to create the patterns. The sets I used for this card, from left to right, are Background Basics: Text Style, Floral Fusion (this was the free set we received when we spent (muffled response) dollars at the PTI store), and Polka Dot Basics II. The set used for the main image is Pond Life, a set that I have barely used but totally love. I really like how all of the images are separate, allowing the user to create their own scene. I used about seven stamps to create my card. As you can see in the photo above, there is a lot of dimension to the card, thanks to some fantastic puffy tape. I used glossy glaze to give the frog a shiny appearance, Stickles to liven up the dragonfly wings, and Sparkly Fluff for my cattails. I also added just a hint of color (a pale blue and yellow) to the background to create a water/sky landscape. Here's the entire card, with a layout loosely based on an old Mojo Monday layout. (I've been having a blast using their layouts for inspiration! Check them out!) So now it's your turn! 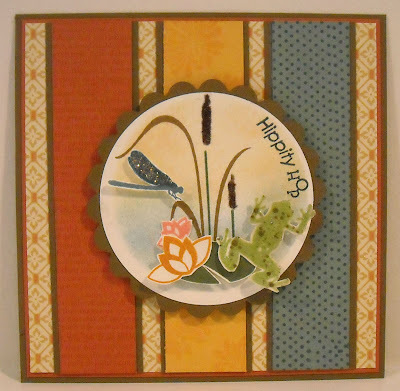 Try mixing up some fun patterns on your next card and have a hippity hoppity day! 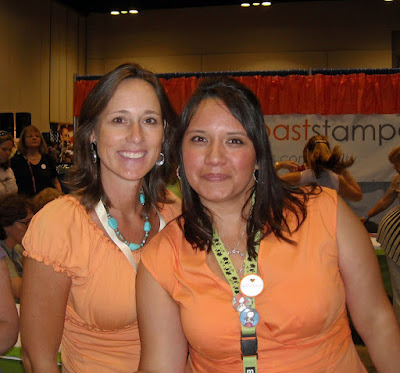 Like many stampers, my life was made complete when I got to meet Deb Olson. 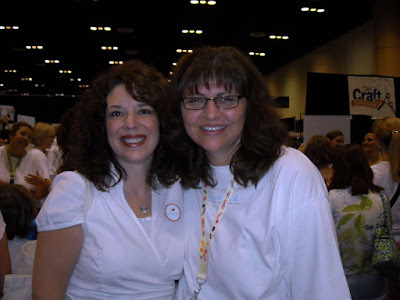 While Deb and I have emailed back and forth a few times (she was gracious enough to do a blog post on our Stamping Around CT event), we've never met in person. She is just a sweet and genuine as she seems on her blog. Deb was working in the PTI booth, helping with a make 'n take. Julie and I would have liked to stay for one of the PTI make 'n takes but we probably would have had to wait about 12 hours to get to the table! Meeting Deb was definitely the highlight of my trip! :-) The Splitcoast Stampers booth was packed too! They also had some great make 'n takes and we were able to sneak in one hosted by Taylor. I'll have to get a picture of Taylor's card...it is adorable and we were even given a mini stamp set to take home with us! Here are Beate and Jenn working the front table where attendees could make a I *heart* Splitcoast pin that was very cute! And only once during the entire two days did someone come running up to Julie and I and say, "aren't you from Stamping Around?" Ah, finally our rock star moment! LOL! This is Beverly and we had a delightful time chatting with her! We also had an excellent time chatting with Taylor and her mom at a cocktail party hosted by MFT.